Mashed, boiled, fried, baked – doesn’t matter. This is one of my favorite ways to eat potatoes. I found it first on this blog. They are super easy and delicious! I like to eat mine with broccoli. Wash and bake the potatoes. Leave the oven on when you take out the potatoes. Cut off a small portion of the top of the potato, lengthwise. Let cool. With a spoon, scoop out the inside of the cooked potatoes and place insides in a bowl. Make sure you don’t completely hollow out the potato. There needs to be enough inside that the skins can still stand up. 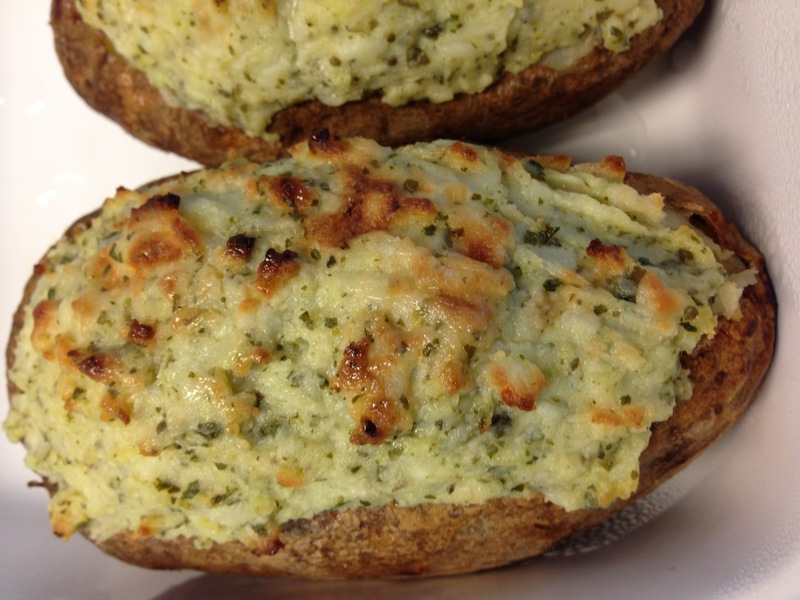 Add pesto sauce and cheese to the bowl with the cooked potatoes. Mix with a fork so that the potato mashes and everything blends. Spoon mixture back into the potato skins. It will heap over. Put the potatoes back into the oven until the cheese is melted and the tops are browned to your satisfaction. Now I see the picture!! I am going to try it this week! !